With apologies to Muhammad Ali and Joe Frazier, Portland State's knockout of Montana on Saturday rates as the "Thrilla in Missoula." A freshman from Murietta, California, Cody Williams, kicked a 52-yard field goal with four seconds left to lift PSU to a 22-20 win over the then-14th-ranked Grizzlies. It was Portland State's first Big Sky victory ever at UM. Heroes were too numerous to list in what was the proverbial team victory. But let's start with the offensive line, tight ends, running backs and the defense. For the first time this season, and in a long while, PSU was able to establish a productive run game and protect the quarterback, giving starter Davis Alexander time to throw from the pocket and down field. Sirgeo Hoffman, a transfer who prepped at Gresham, led the ball carriers. Overall, the Vikings were able to control the game with the blue-collar, physical style coach Bruce Barnum likes to employ. And the PSU defense picked up where it had left off the previous week in a strong effort at Idaho, which managed only one offensive TD but beat the Viks, 20-7. 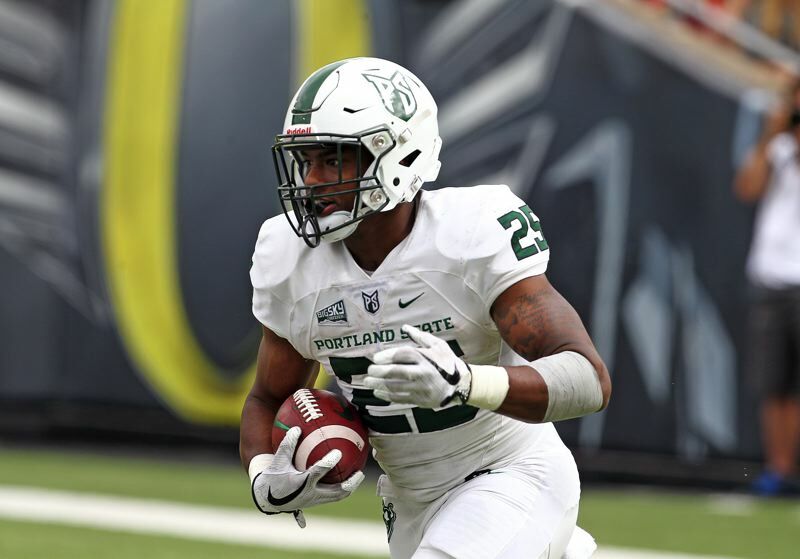 Portland State hadn't won a Big Sky game since late in the 2016 season. The Viks had lost 12 of those in a row. Williams has been almost perfect as the team's new kicker. He had three three-pointers at Montana, and the winner was the longest of his career by six yards. Funny thing is, for weeks the Vikings, while grateful to have Williams splitting the uprights, had talked about how they needed more touchdowns, especially in the fourth quarter, to win games in the Big Sky. They did get one fourth-quarter TD on Saturday, but in the end it was up to the right leg of a guy who also was near-perfect last season at Murrieta Valley High. Go to Providence Park on Saturday to find out. The Vikings will play Northern Colorado there at 2 p.m., in what is Portland State's only true home game this season, and homecoming. Lewis & Clark had a 20-0 second-quarter lead at home against Puget Sound before falling, 34-22, last weekend. The Pioneers are 2-2, 1-1 in the Northwest Conference, but have to visit Linfield (2-2, 1-1) at 1:30 p.m. Saturday. Playing six of their first seven games on the road did not faze the Hawks, who last season had a better record away than at home. Portland (4-2-0-1) enters Wednesday's 7 p.m.game at Memorial Coliseum against Edmonton with four consecutive wins. Joachim Blichfeld (Western Hockey League-leading eight goals and 17 points through Sunday) and Cody Glass (league-high 12 assists) are off to fast starts, and the Hawks' 29 goals are the most in the Western Conference. But Portland would not be winning without strong play from goalie Shane Farkas. Perhaps it's a sign of Portland's youth that the Hawks have the most penalty minutes (143, or more than a period's worth per game) and more times shorthanded (46) than anyone in the league. But with some sharp play from Farkas, the Hawks have allowed only eight power-play goals. Wednesday's game is the first of three in a row at home, including a visit on Sunday from Everett. In his first NHL game, former Winterhawks defenseman Dennis Cholowski scored the first goal of the season for the Detroit Red Wings in an overtime loss to Columbus. That Cholowski, 20, made the Red Wings' roster is a tribute to his work ethic and confidence. Injuries opened up some spots on defense in Detroit, and Cholowski's strong training camp earned his spot. • Henri Jokiharju is off to a good start with the Chicago Blackhawks. The former Winterhawks defenseman has five assists and a plus-5 rating three games into his NHL career. The Portland Pilots men started West Coast Conference on the right foot. Eventually. After falling behind 2-0 on Saturday at Gonzaga, the Pilots rallied to win their WCC opener, 3-2. Ranked 11th last week, Portland improved to 9-0-2l. Benji Michel drew a penalty kick and converted for his 10th goal of the season to get Portland within 2-1 at halftime. Luke Hendel's first goal of the season, a nice chip over the goalkeeper after a give-and-go with Michel, tied it an hour into the match at Spokane, Washington. Malcolm Dixon's third goal of the season gave Portland the lead in the 72nd, and a big one-handed save from goalkeeper Kienan Weekes preserved that lead. With only a seven-game league schedule, dropping points to Gonzaga (2-7-2) would have been a tough blow. Perhaps it was jitters that had the young Pilots playing frantic soccer early in the match. Now Portland returns to Merlo Field for games at 7 p.m. Friday against Loyola Marymount and 2:30 p.m. Sunday against San Diego. Portland has a 3-1 WCC record after home wins over Saint Mary's (3-0) and Pacific (4-1). Sophomore forward Taryn Ries scored four goals over the weekend, including three against Pacific, and has 13 on the season. Portland is idle this week ahead of an Oct. 19 visit to No. 4-ranked Santa Clara.